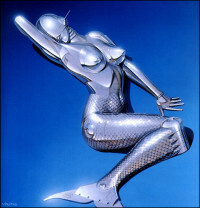 Hajime Sorayama was born in 1947 in Ehime Prefecture, Japan and entered Shikokou Gakuin University in 1965. In 1967, he published his first work PINK JOURNAL, and in the same year he dropped out to study art at Chuo Art School. 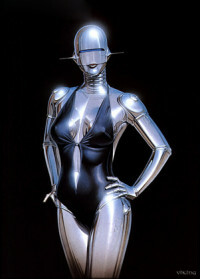 In 1968, Sorayama graduated from Chuo Art School and started to work as an illustrator at an advertising agency. 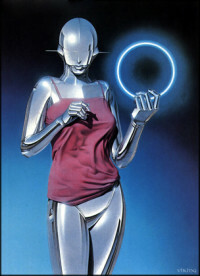 In 1972, he began working as a free-lance illustrator and drew his first robot, which became his most notable subject, in 1978. 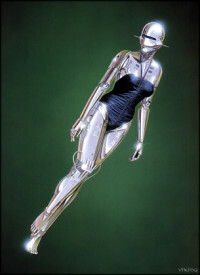 Sorayama is known for the hyper-realistic images of fanciful women he creates with brush, pencil, acrylic and paint. His work has been exhibited both nationally and internationally.